Seafront gem: Asia Green designs diverse residences for the trendy islander. Penang is a locale in high demand amongst investors and homebuyers alike. However, as land is becoming scarce especially on the island, it is rather difficult to come across property choices that are both architecturally sound and enjoy unrivalled location within the island. Asia Green is amongst the few developers that manages to build properties that cater to the needs of investors and buyers. The property developer will soon launch its newest architectural masterpiece dubbed QuayWest Residence, located along Persiaran Bayan Indah near Queensbay Mall. The theme adopted by QuayWest is to live life glamorously, offering spectacular shorelines that are coupled by sparkling azure seas and sandy beaches to wake up to everyday. This luxurious waterfront gem will sit on a 7.4-acre plinth of commercial land located just five minutes away from Queensbay Mall and will consist of two 24-storey freehold condominiums. Designed to mirror the essence of luxury, QuayWest offers carefully crafted homes that offer layouts between 760 sq ft to 2,013 sq ft. The units are presented in configurations that range between two-bedroom units up to spacious duplexes, giving out the feeling of staying in a landed property while living in the sky. 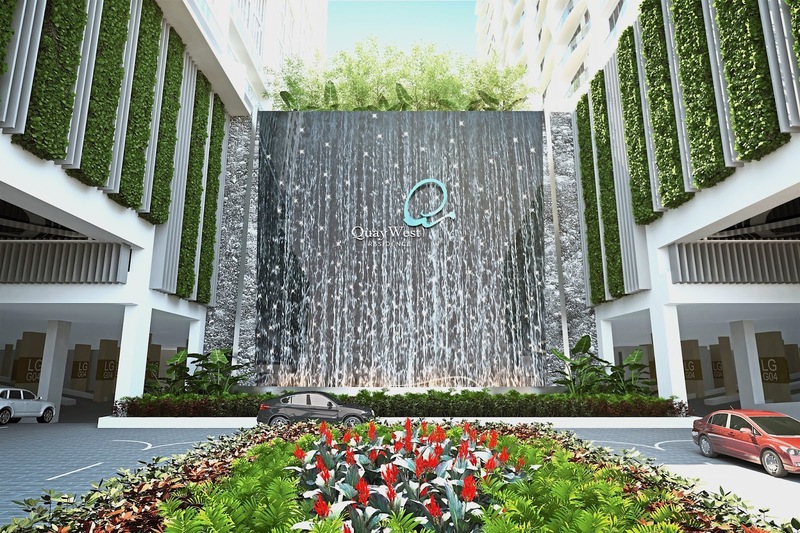 One’s luxurious lifestyle experience kicks off the moment one passes through the majestic entrance of QuayWest Residences. Future residents will be greeted by a grand lobby offering direct access to each house, where two units would share two private lifts that open to individual foyers for added privacy. Step inside a typical unit within QuayWest Residences and one will be greeted by stylish interiors that begin right at the doorstep, into the living room, leading to the bedrooms, balcony and even the kitchen that will cater to the modern islander. Some of the units featured within the property offer an innovative dual key concept, which basically means two units fitted into one. This option is perfect for larger families with elderly parents, close relatives or even for those wanting to generate additional income via renting out adjoining units. QuayWest Residences will offer lifestyle indulgences that may even rival that of five-star resorts. These facilities on the podium include sky and children’s pools with private cabanas, Jacuzzi and pool decks with a lounge. There will also be a gym that can double up as a dance room, an entertainment room, multipurpose hall, conference and reading room, as well as a children’s playground, set alongside beautifully landscaped gardens. On the rooftop, residents will be greeted by an infinity pool with Jacuzzi offering sweeping views of the sea and Jerejak Island. Additionally, this space will also offer a yoga deck for one to reconnect with the inner being. QuayWest Residences is backed by unrivalled amenities as it is located near to Queensbay Mall, a hotel and a food court while a mere short walk away will bring one to various shops and facilities. The residence is easy to get to as it is located between both Penang bridges, offering ease of access for future residents to set to mainland Penang. The renowned city of George Town is also located nearby the property via the Tun Dr Lim Chong Eu Expressway. One can also find the Penang International Airport, Bayan Lepas Free Trade Zone, Gurney Drive, Batu Feringghi and the ferry terminal a short drive away from the development, assuring residents connectivity to all the places that matter most on the island. 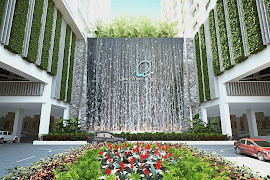 QuayWest Residence will be launched in Penang via a pre-Chinese New Year Fair in Queensbay Mall from the January 19 to 22. Asia Green will be offering attractive and worry-free packages to help ease the burden of potential buyers that are eager to own their dream homes when they sign up during the official launch. A lucky draw will take place in which those taking part would stand a chance to win an additional discount up to RM50,000, cash prizes and car park lots.